Johor Bahru is a Malaysian town that sits just across from the border with Singapore. As is the case with many border towns, it had a rather seedy reputation for years before cleaning up its act and developing a great range of new family friendly attractions that have helped its popularity to soar. If you are in Singapore and looking for a quick day trip then Johor Bahru is a great choice, and you will find a number of cutting-edge malls, bars, and eateries here. If you want to enjoy some of the history of this area however, then the city has a good range of historic and cultural sites, many of which date from the time of the British colonial period. Any history buff will also enjoy the number of fascinating museums in Johor Bahru or you can spend time eating your way around the city. Like much of Malaysia, Johor Bahru has a delicious local street food scene, and some of the bakeries here are famous for having been in operation for decades. 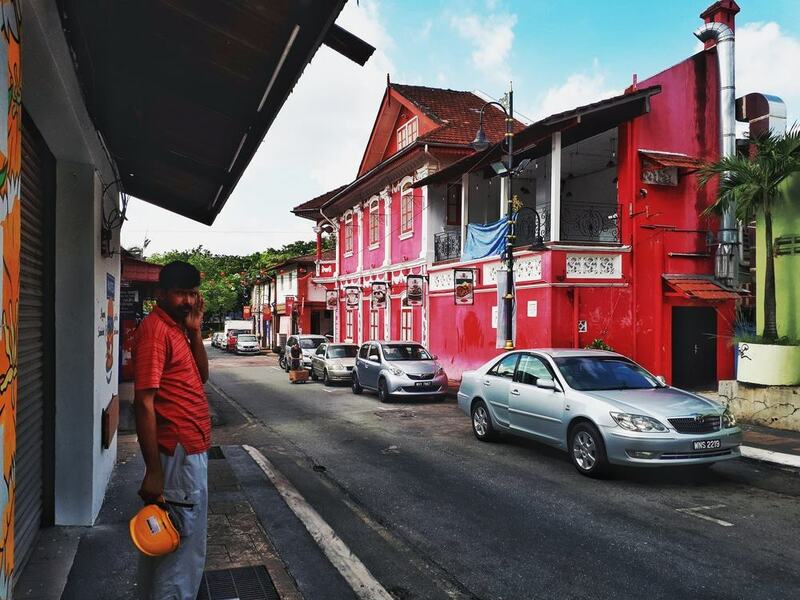 Jalan Tan Hoik Nee is named after one of the founding fathers of Johor Bahru and is also known for being one of the oldest neighborhoods in the city. 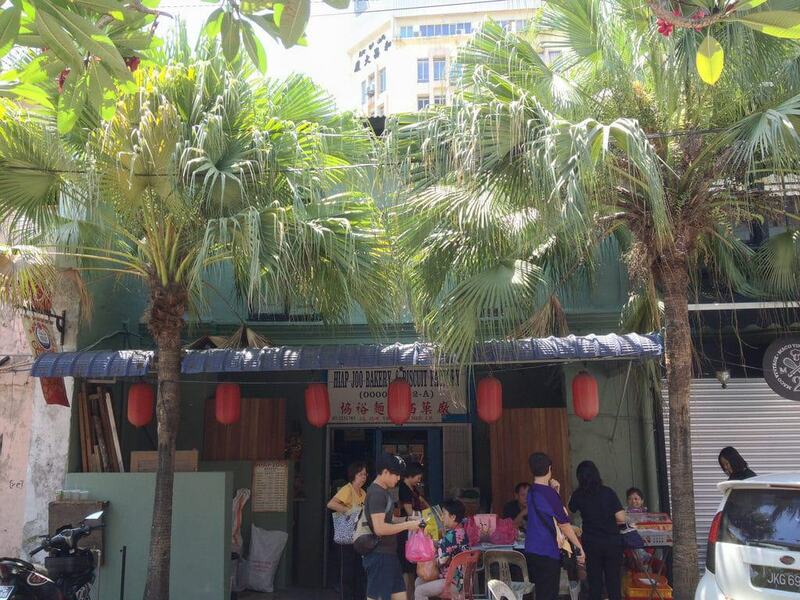 It is here that you will find a number of delicious cafes and restaurants and there is also a high concentration of antique shops dotted along Jalan Tan Hiok Nee. The architecture is also spectacular here and you can expect traditional Chinese style shop houses as well as a number of colonial buildings. Johor Zoo was one of the first zoos to be built in Southeast Asia and dates from 1928. There are over a hundred different species of animals here and you can expect to find gorillas, elephants, lions, and flamingoes, to name just a few examples of the fauna on show. There are also bird and reptile houses at the zoo and a number of eateries dotted around in case you fancy a bite to eat. If you are travelling with children then this is an excellent pick and there are also opportunities to interact with some of the animals during feeding times. 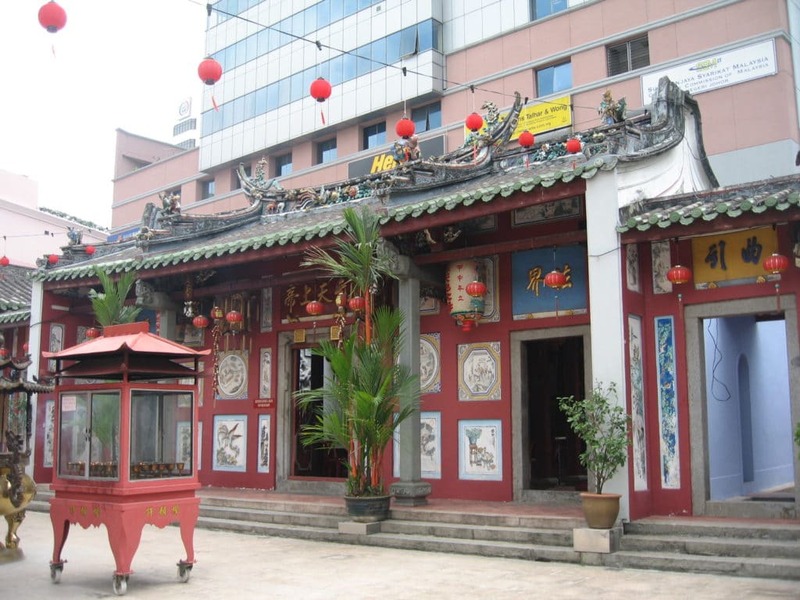 Johor Bahru Old Chinese Temple is a traditional temple that dates from the 19th century and was built in honor of five deities venerated by the Chinese community. This is one of the oldest religious buildings of its kind in the city and is instantly recognizable thanks to its bright red and white color scheme. In addition to the actual temple you will also find some exhibits that tell the story of how the Chinese community first came to Johor Bahru. Certainly no trip to the city is complete without a visit to this famous site. The Istana Besar is the Royal Palace and would have been the home of the Sultan of Johor in the days of old. This impressive building was constructed in 1866 during the time of Sultan Abu Bakar and is a stunning mix of Malay and Western architecture. Make sure to look out for the large dome that tops the structure as well as the signature blue roof. 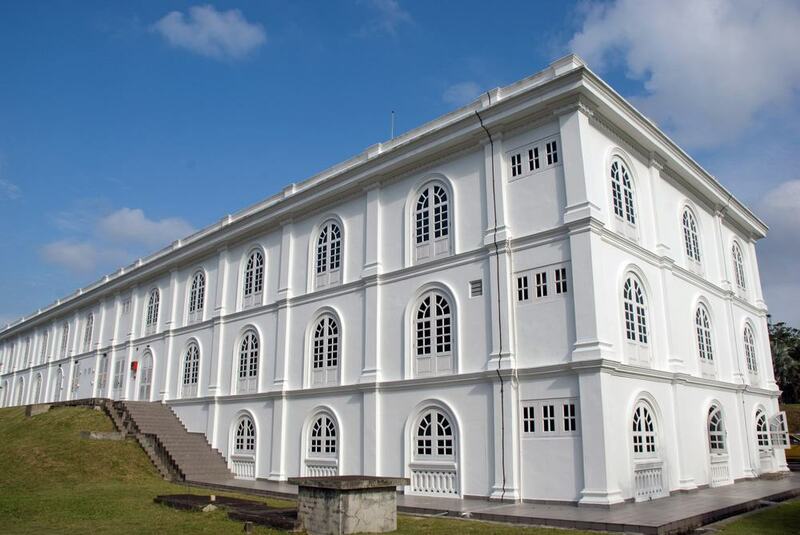 Other points of interest here include the Royal Abu Bakar Museum which has a collection of antiques and heirlooms that would have belonged to the Royal Family. 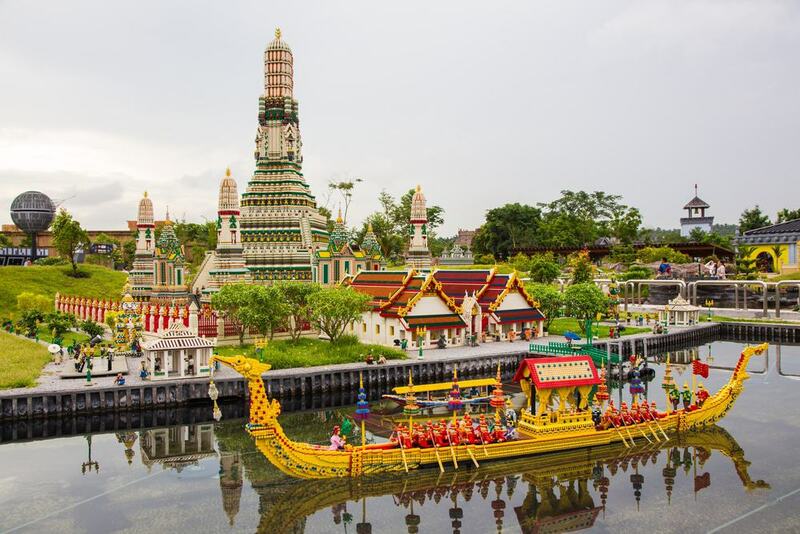 Anyone traveling with children should make sure not to miss Legoland Malaysia which has some 40 different rides that younger visitors will love. The park opened in 2012 and there is an adjoining water park here where you can cool off with a range of water related rides and pools. Some of the highlights at the parks include bumper cars and planes as well as a laser quest maze. This is one of the most popular theme parks in Johor Bahru so expect it to be busy whenever you visit. The Johor Bahru Kwong Siew Heritage Gallery is a museum that is located in two traditional shop houses that date from 1907. 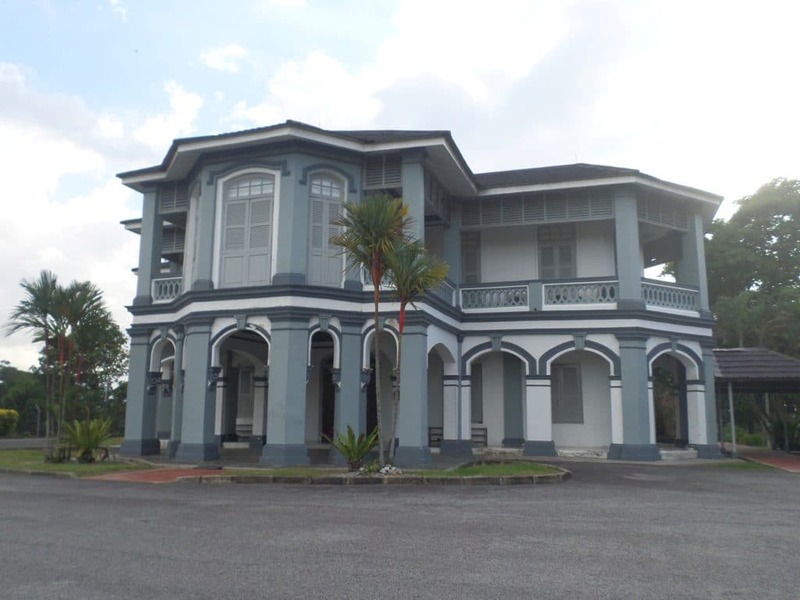 The buildings would have been used as the headquarters of the Kwong Siew Clan Association that was created by Wong Ah Fook, a Chinese born businessman who worked closely with the Sultanate of Johor. The museum tells the story of the members of this clan and you will find ancient photographs as well as weapons, traditional costumes, and even oddities like antique opium pipes. Make sure to check out the collections of old coins as well as the fortune telling equipment and the traditional cups, plates, and bowls. 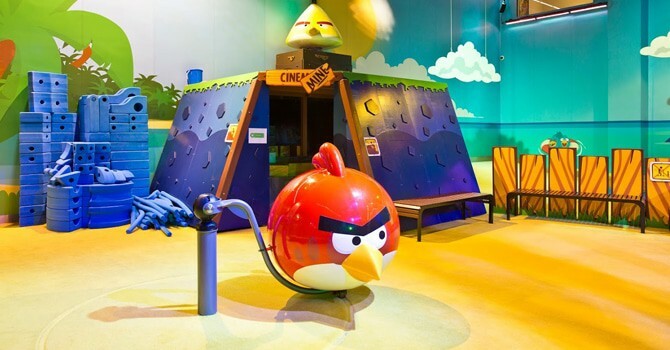 The Angry Birds Theme Park is a large theme park that is dedicated to everything Angry Birds related. This is one of the most popular attractions in Johor Bahru and the park sprawls for an amazing 26,000 square feet, As well as rides and amusement arcades there are also daily shows and performances with the Angry Birds characters and one of the big draws of the park is that it is open late into the evening so you can stay here and really feel that you are getting your money’s worth. 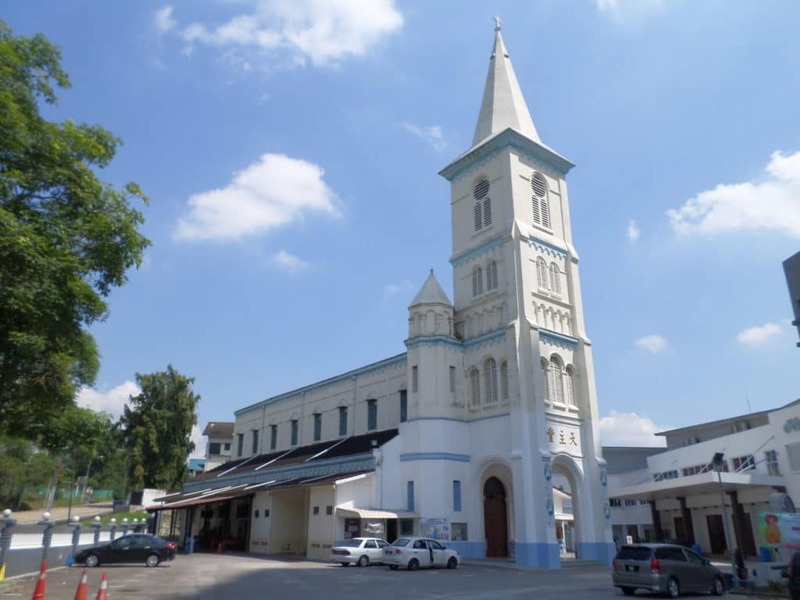 Sultan Abu Bakar State Mosque was built over a period of some eight years starting in 1892 and is a mix of British colonial architecture and traditional Islamic motifs. One of the signature features of the mosque is the four minarets that are located on the top and are meant to look like traditional British clock towers. Much of the interior is covered in white marble and you will find a pretty blend of quaint Victorian design features mixed with Moorish motifs. The mosque can accommodate some 2,000 worshippers at one time and if you like religious architecture then this is not to be missed. The Arulmigu Sri Rajakaliamman Glass Temple is one of the most important buildings for the Hindu community in Johor Bahru and was the first Hindu building in the world to be made of glass. 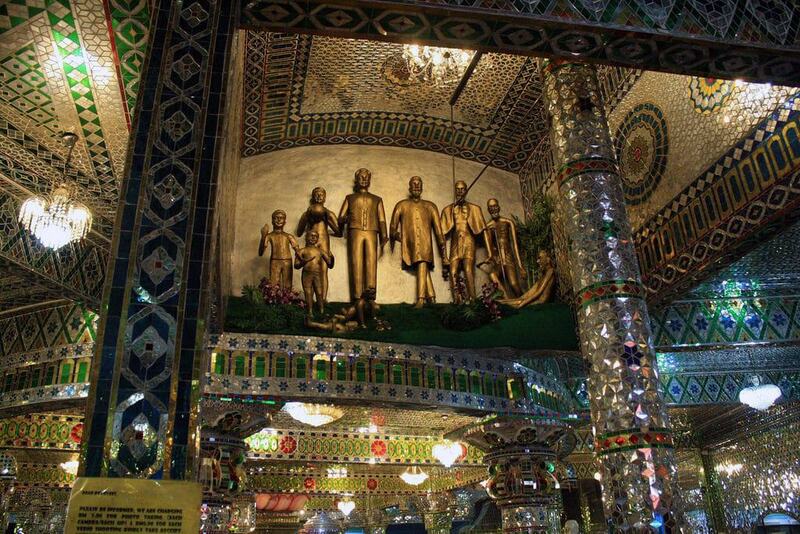 Both the interior and exterior are decorated with glass which makes it glitter in the light of the sun, and you will notice statues of Christ and Buddha inside even though this is a traditionally Hindu building. If you like unusual structures then make sure not to miss this quirky stop off the itinerary. The Salahuddin Bakery first opened its doors in 1937 and has been in operation ever since. Here you will find a delicious selection of baked treats, but one of the main reasons that people have been flocking here for years is for the curry puffs which are a traditional Malay snack of curried meat or vegetables stuffed inside flaky pastry. The bakery has not changed much since the days of old and the inside still looks like it would have done in the 1930s. 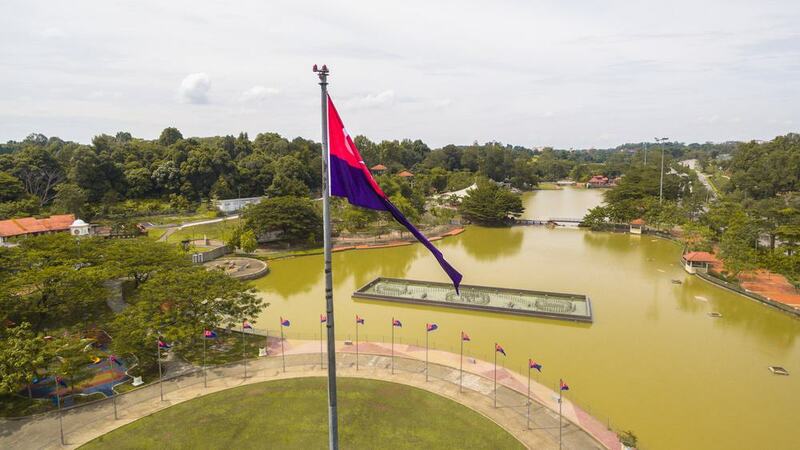 Istana Bukit Serene is now the official residence of the Sultan of Johor and as such it is not open to the public. Many people still come here however to check out the exterior and you will find an arch here topped with a large model of the crown of the Sultan and you can also check out the manicured lawns from the outside. The palace dates from 1933 and was built in the Art Deco style and as such it is a riot of interesting carvings and is topped with a main tower that soars to a height of 35 meters. 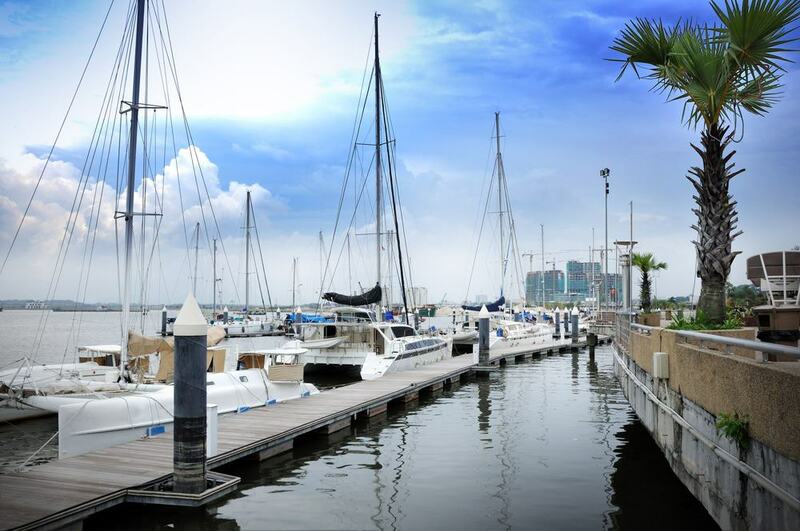 Danga Bay is a waterfront complex that has a range of dining and lifestyle attractions. 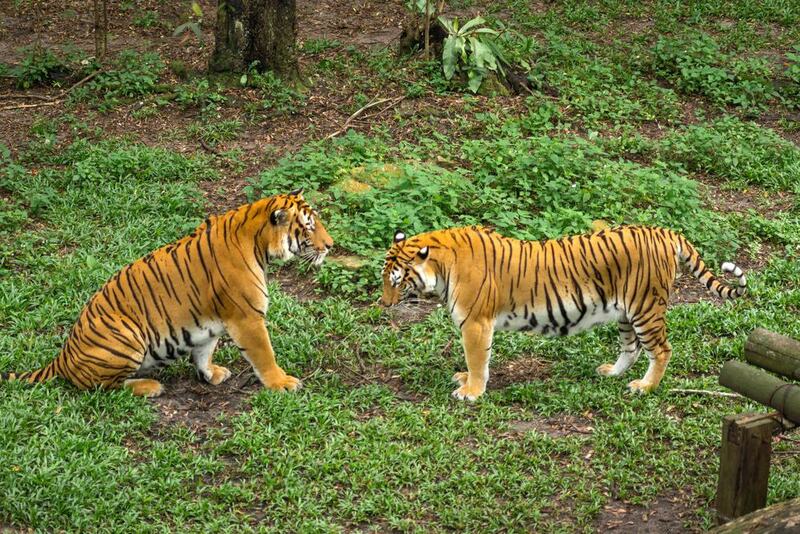 It is a very popular spot for tourists in Johor Bahru as it is also the home of the Danga World Petting Zoo which is smaller than the main zoo in Johor but has animal shows where younger visitors can get up close to the animals. Danga World Theme Park is also located in the Danga Bay Complex and has around 20 rides such as a scenic Ferris wheel and spinning tea cups. 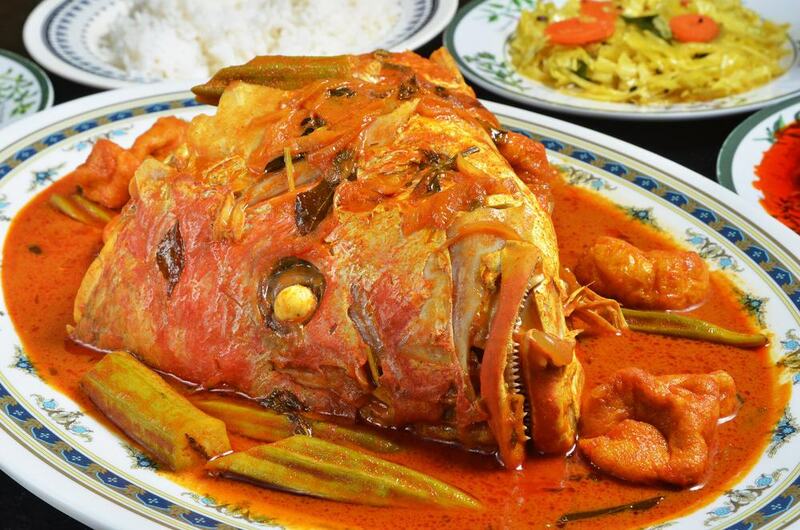 Johor Bahru has a great food scene and one of its famous dishes is the traditional fish head curry. If you fancy trying some then head to Kam Long Fish Head Curry which will probably be easy to spot as it usually has a long line of hungry patrons outside. They only serve one dish here which is the aforementioned curry, although there is the choice of having the head replaced with fish tail if you prefer. Either way the curry base is the same and you can expect a delicious thick sauce that comes with bean curd, ladyfingers, and tomatoes. The Roman Catholic Church of the Immaculate Conception is one of the oldest buildings that still stands in Johor as it was built in 1883. The structure is known for its lone steeple that is topped with a scenic spire and it is designed in the traditional British colonial style. The church is also known for its colorful Harvest Festival which takes place in January and is based on the Tamil datival of Pongal, so if you are in town at the right time of year make sure not to miss it. 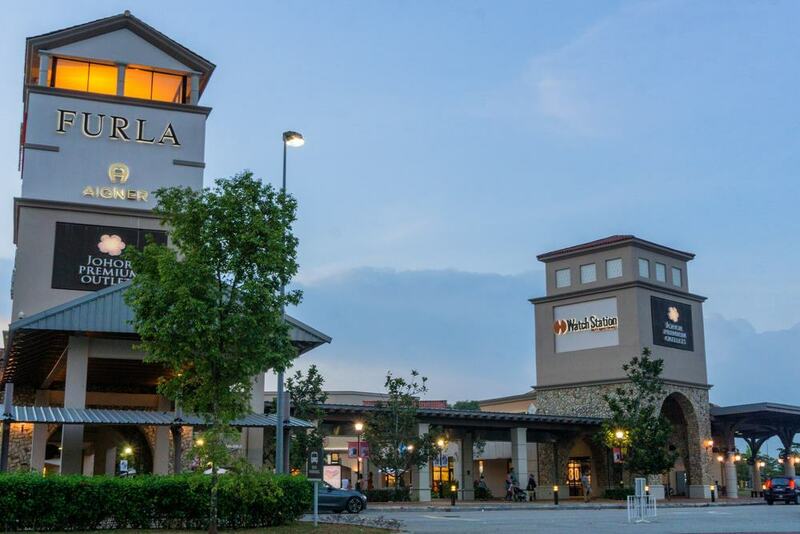 One of the big reasons that visitors flock to Johor is for the bargain shopping opportunities here, the best of which are found at the Johor Premium Outlets. This shopping mall style complex carries a huge range of international and local brands all of which are sold at competitive prices and there are also some eateries and cafes here so you can get a bite to eat in between all the shopping. 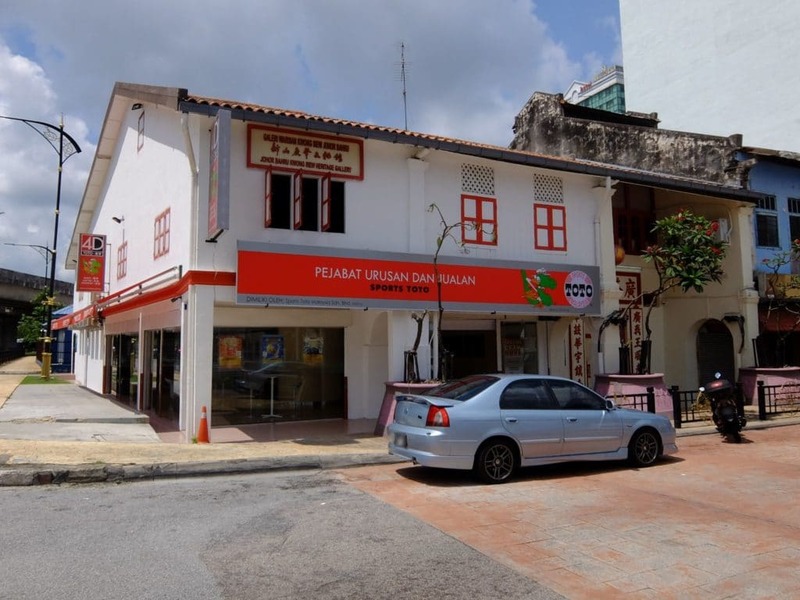 The Johor Bahru Art Gallery is located in a building that dates from 1910 and this is a great place to come if you want to know a little more about Malaysian art work. The gallery has a range of different kinds of art on show such as Islamic calligraphy as well as ceramics, weaponry, and even ancient bank notes and coins. You will also find some modern paintings on display and the building is topped with a thatched roof and has a large ceremonial drum at its entrance. One of Johor’s great claims to fame is its religious diversity and with that in mind you can visit a Sikh temple here which was built in 1992. 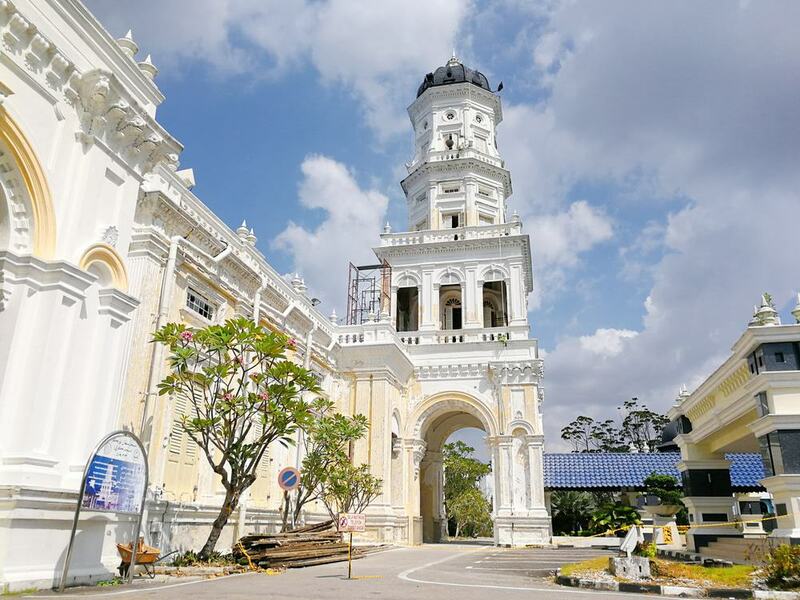 Visitors come here to check out the signature yellow window frames as well as the pretty crenellated roof and this is an important place of worship for the 250 Sikh families who call Johor Bahru home. 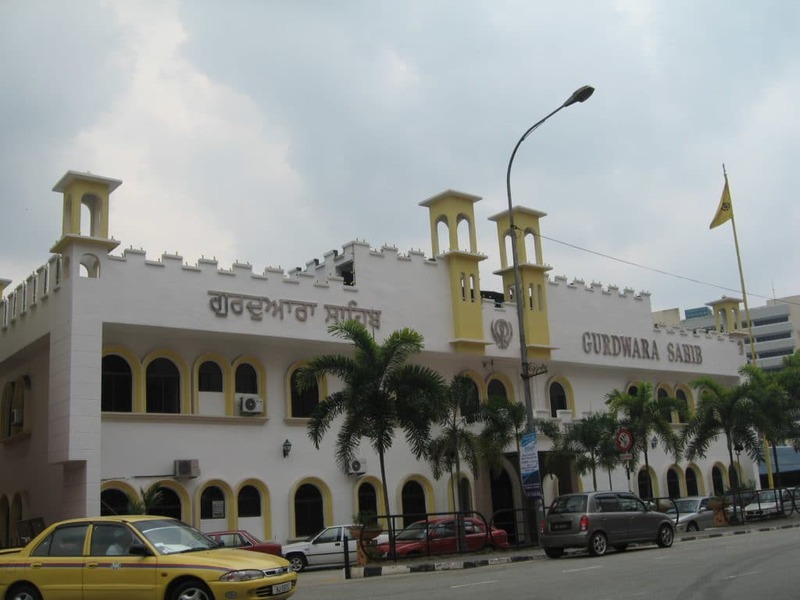 If you are visiting all the other religious sites in town then make sure not to give Gurdwara Sahib Johor Bahru a miss. 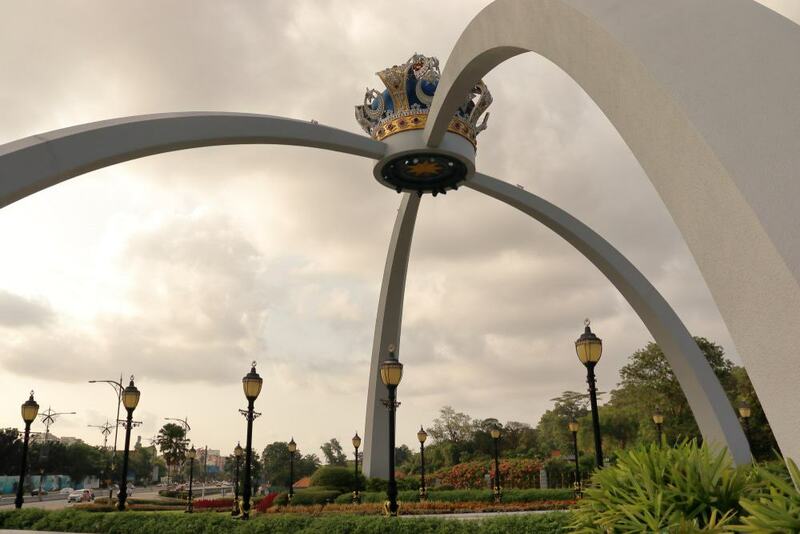 Located on Jalan Abu Bakar is the War Memorial which is made up of two obelisks that are dedicated to servicemen who lost their lives in the First and Second World Wars. It was built in 1962 and is a moving stop off on a tour of the city. It is also known for its pretty views that look out over the Strait of Johor. Taman Merdeka is the largest public park in the city and is a great choice if you want to get outside and enjoy one of Johor Bahru’s green spots. The park has a range of interesting sections such as an open-air theater and a series of rock sculptures. Other points to look out for include the monument dedicated to Malaysia’s independence as well as some cannons and a clock tower. Johor Bahru, like the rest of Malaysia, is known for its amazing hawker street food. With this in mind, if you want to sample some of the best in the business, then come to the Medan Selera Meldrum Walk which sets up in the evening and has a wide selection of typically Malaysian dishes. Some of the highlights sold here include delicious laksa which is a creamy soup flavored with coconut milk as well as ikan bakar which is fish rubbed in a spice paste and then grilled over coals. Johor Bahru is next to the water and looks across to the Strait of Johor. As a result, you will find a long strip of sand along the coastline here and one of the best places to take it all in is on Desaru Beach. 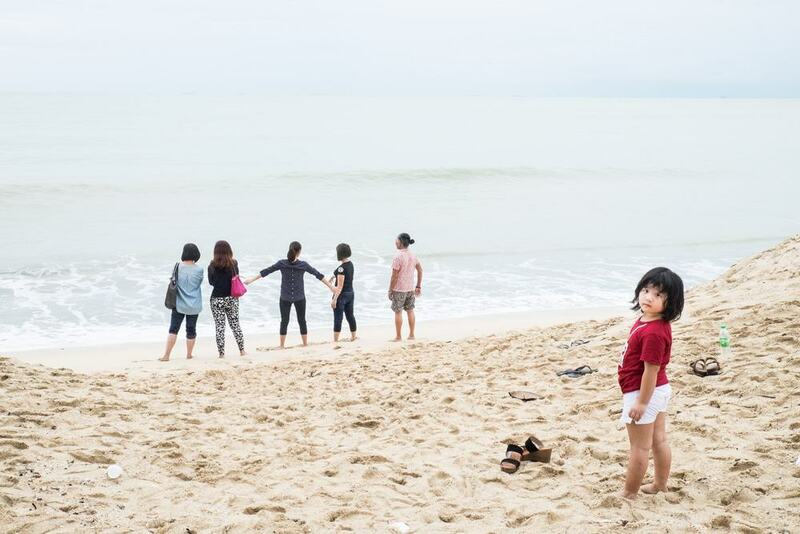 A day on the beach may be just the ticket in Johor Bahru if you are looking for a place to relax away from the main hubs which are often filled with bars, clubs, restaurants, and shopping malls. Some of the activities that you can enjoy here include going for an exhilarating banana boat ride or you can have a go at jet skiing. This area is also known for its beach resorts if you want to stay in Johor Bahru a little longer. Johor Bahru is known for its shopping options but this usually comes in the form of high tech malls. If you are looking for something a little different, then head to Pasar Karat which is a large flea market that has a wealth of hidden treasure just waiting to be discovered. On a trip here you can expect to find a wide selection of second hand goods such as clothes and antiques and haggling is expected. Make sure to note however that the market only opens in the evenings and things usually get moving only after 8 pm. As is the case with many border towns, Johor Bahru is known for its spas. As such, if you are looking for a way to relax and unwind while you are in town, then you will have come to the right place, and you will find spas all over the city. 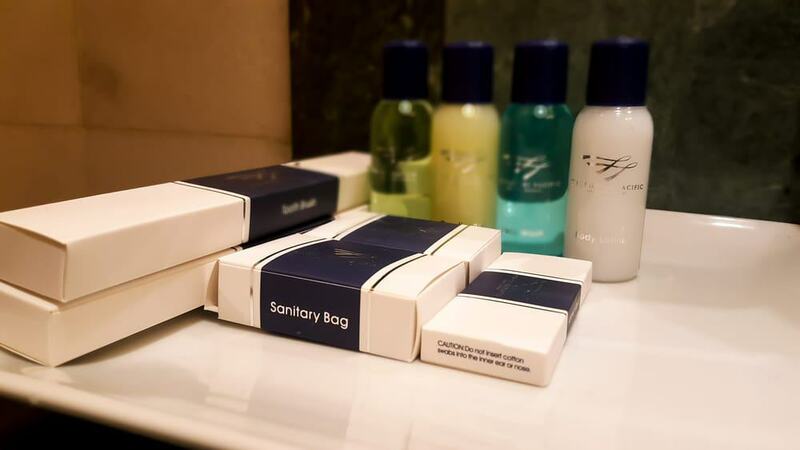 One of the best known venues is a chain called Wang Zu Bu Luo and most of the spas in town offer similar services. These include massages, facials, manicures, and more traditional treatments such as ear candling and cupping. 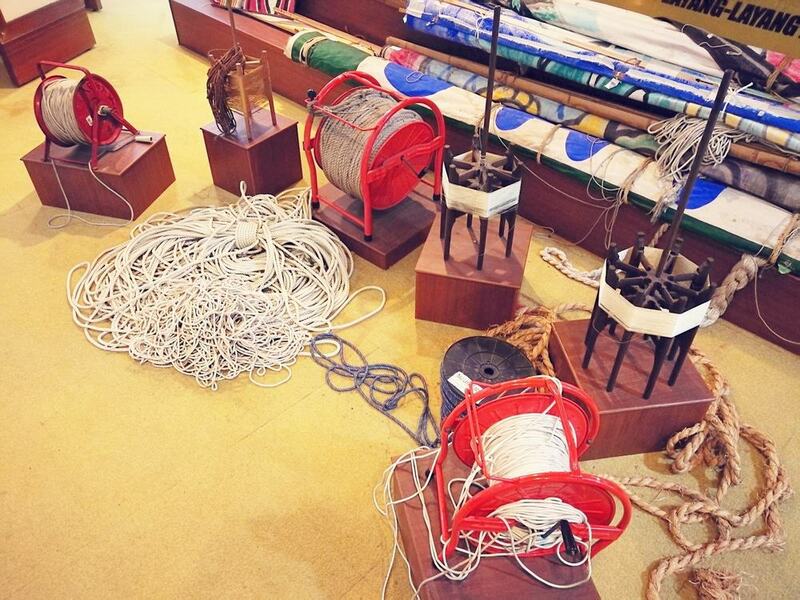 Opened in 2002, the Pasir Gudang Kite Museum, or Muzium Layang-Layang as it is called in Malay, has the claim to fame of being the first museum in Malaysia to be completely dedicated to the history and cultural impact of these colorful kites. As a result you will find a number of galleries with information about how layang-layang evolved and are made, as well as posters and videos about kite flying. There is also an annual Kite Festival in Pasir Gudang and you will spot the museum a mile off as it has a quirky windmill structure on its roof. This also serves to generate electricity to run the museum and if you are looking for a quirky attraction in Johor Bahru then this is a great pick. 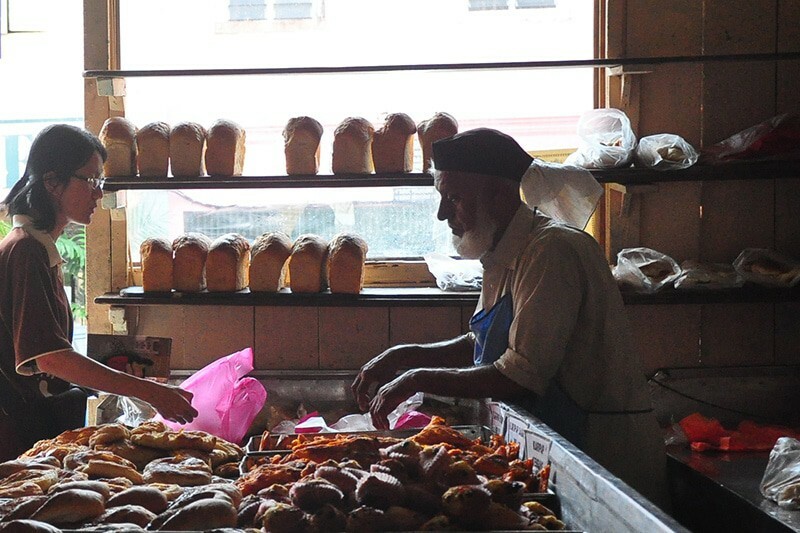 This bakery in Johor Bahru is famous for having been in operation for more than 80 years. As you can tell, they must be doing something right, and you can come here to sample the toothsome baked goods for yourself such as buns, cakes, and biscuits. The bakery is known for using a charcoal oven to bake its treats, which was inspired by the traditional way of making biscuits in Hainan in China which was the hometown of the original owner. Don’t be surprised if you have to queue here and make sure to try the signature pillowy banana cake.